Step right up and roll the dice! This colorful “boardwalk” theme creates a fun carnival like game experience. 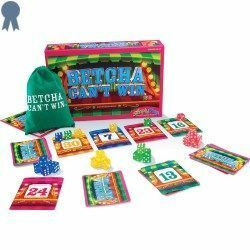 Roll as many times as you like to try to match the sum on the Number Cards but be careful there is a price to pay! Roll dice and combine their sums to match target sums displayed on number cards. Collect the number cards you match and secure their points if no other player can match their target sum that round. Secure the most points by the end of the game to win!